Learning how to bid lawn care and landscaping jobs, when you are just getting your business started, is a huge task. Most of the times, those in the know aren't going to share with you all the lessons they've learned and the tips they have picked up over the years. But I will. I operate one of the largest lawn care business forums on the internet, The Gopher Lawn Care Business Forum. On that site I have interviewed thousands upon thousands of lawn care business owners over the past decade. Throughout this process, I have learned a lot. All that I have learned, I want to share with you. 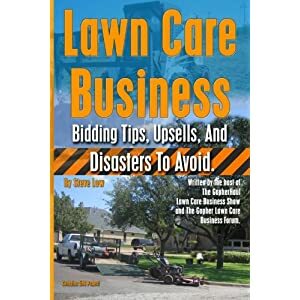 The goal of this book is to give you, the lawn care business owner, a working knowledge of the entire bidding process for most of the jobs you are going to be called upon to bid. To give you a better idea on how to go about bidding jobs, services you can upsell, how to upsell, and how to perform those jobs. This book is somewhat large at close to 600 pages but I really wanted to include a lot of information. Read it at your own pace and later you can use it for years to come as a reference manual. Keep going back to this book over time, to get more ideas on how to improve your business. After your reading, I feel confident you and your business are going to be in a better place. If you would like to read more about how to improve your lawn care or landscaping business, check out my many books on the topic.